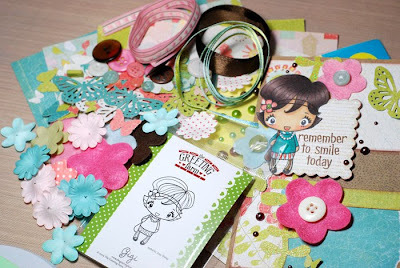 Up for grabs today is a brand new Wild Sprout Stella rubber stamp, five 6x6 sheets of Making Memories paper, four 6x6 sheets of double sided BoBunny paper, Prima e.line pearls and gems, Maya Road heart pins, Fancy Pants glitter heart transparency, Making Memories Valentine's die-cuts and paper flowers, misc buttons and ribbons, four card blanks and four envelopes plus my card. Alrighty, I hope to see you all playing along with the big release party this weekend! 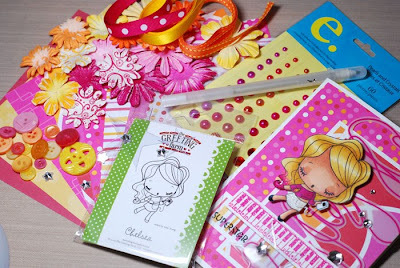 Hello and welcome to the third installment of this week's super fun Wild Sprout sneak peeks and candy! 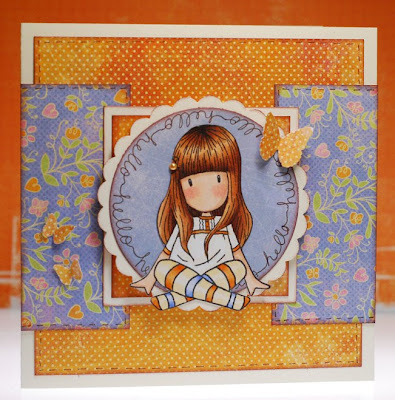 Be sure to check out both the TGF and Club Anya blogs to see all the fabby cards from my wonderful CA team mates and the Farmers, there is a lot of Gigi love out there today and I promise you won't be disappointed! 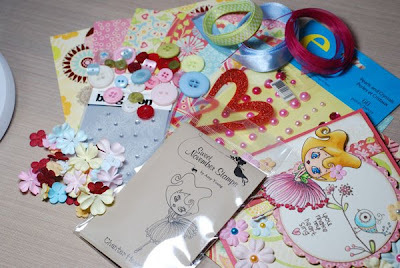 Up for grabs is a brand new Wild Sprouts Gigi rubber stamp, six double-sided sheets of 6x6 Crate paper, Prima e.line pearls and gems, Making Memories felt and paper flowers, some ribbons, buttons and punched butterflies, four card blanks, four envelopes and my card. Okey dokey, I'll see you all again tomorrow with the fourth and final Sprout sneak peek. Later! 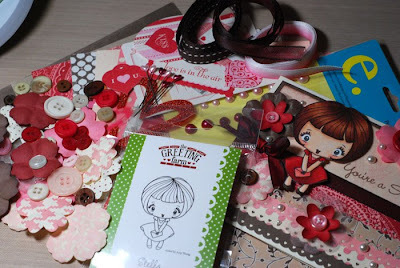 Up for grabs is: a Wild Sprouts Ruby rubber stamp, six double-sided sheets of 6x6 Love, Elsie paper, two sheets of 6x6 Love, Elsie embossed cardstock, three spools of KI Memories ribbon, Love, Elsie chipboard buttons, Prima Got Flowers and eline pearls and gems, text book punched flowers, misc buttons and jewel brads, four card blanks and four envelopes... along with my card. Yep I'm posting a bit early today so that it coincides with the first sneak peek reveal of the January release over at Club Anya. Along with a brand spankin' new Wild Sprouts Chelsea rubber stamp there is also eight 6x6 sheets of KI Memories paper, one 6x6 sheet of Hambly screen printed vellum, Prima flowers and eline pearls and gems, Heidi Swapp ghost stars, Kaiser Craft star bling, Sakura stardust pen, misc ribbon, buttons and star gems, four card blanks, four envelopes and my card. So if you would like a shot at winning Chelsea this week just post here. It's as simple as that. You will have until noon on Friday to get entered and then I will announce all four Sprout candy winners Friday evening to go along with all of the TGF release festivities that are planned that day! Our HUGE "In with the NEW at TGF" BASH will begin at 9am CST on Friday 1/1/2010 and run through 8pm with challenges, prizes, and FUN! Each challenge winner will receive a new Sprout of their choice, so be here to party with us! Live overseas? No problem! Challenges will be open through Sunday, 1/3/10 at 8pm CST. WINNERS will be announced on the TGF blog and CA blog on Monday, 1/4/10/ along with the winner of the 12 days of sketches contest. That winner will win the ENTIRE January release. In addition to each individual challenge, ANOTHER prize pack of the ENTIRE Jan. release will go to a random winner who completes ALL of the New Year's Challenges! 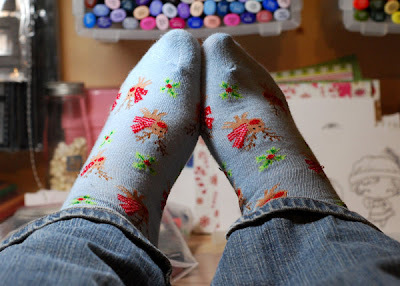 Don't forget that the 12 Days of Sketches are still well underway on the TGF blog. Everyone is having a great time and there are more fun sketches to be used today! This contest will also run through Sunday 1/3/10 at 8pm CST. Just upload your entries to the appropriate galleries and you will be entered into a drawing to win the ENTIRE TGF JANUARY RELEASE!!! SO many prizes... SO many chances to WIN! All to celebrate our NEW YEAR, NEW Club Anya & Friends blog... and New Release with all your friends at The Greeting Farm! Whew! That's a whole lot o' fun to be had at The Farm this week don'tcha think!?! Who says candy is bad for you? 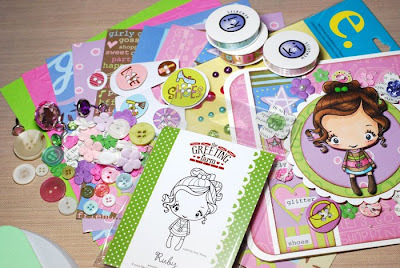 Things are pretty great in my little corner of the world and I'm excited to get this last week of 2009 underway because this crazy blog o' mine is gonna be chalk full o' candy, candy, candy in celebration of a few new stamp releases... yeah! So I'm sure you all know the drill by now. If you would like a shot at winning the candy just leave a post here and if you can link it up on your blog that's great too but not a necessity... I want everyone to have a chance, even if they don't have a blog of their own. And it doesn't matter where you live because I'll ship anywhere... the more the merrier I say! Alrighty get posting, but don't forget to check back daily as I will be adding more candy give-aways tomorrow through Thursday. I told you it was going to be busy, busy, busy! Hello and good morning my friends! Can I just say that it felt both a little weird but totally great to finally be breaking away from all the Christmas cards I've been making lately? My world has expanded to include all the wonderful colors I've been missing, so right off the bat I knew I wanted to take advantage of the Sugar Bowl challenge that includes using your favorite color along with their sketch. 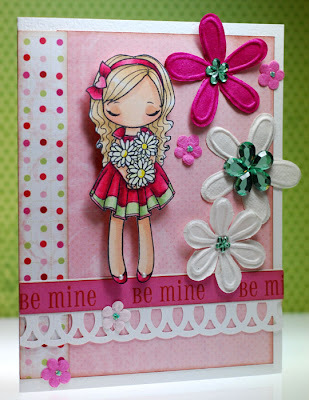 Oh and I also used the TGF sketch #6 for this card... hope you all are finding time to play along! Good morning friends! It may be the most wonderful time of the year but man-oh-man does it have to be the busiest time of year too? 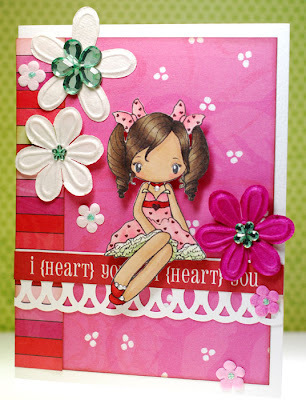 I'm still on the run so I have a quick post for a super quick card today. And as for my card... well, you are looking at a 20 minute card right here. 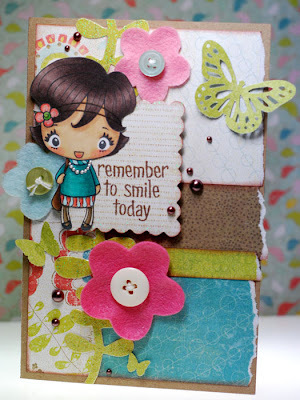 The card base is a pre-printed one from Making Memories that even had the punched holes along the border already. 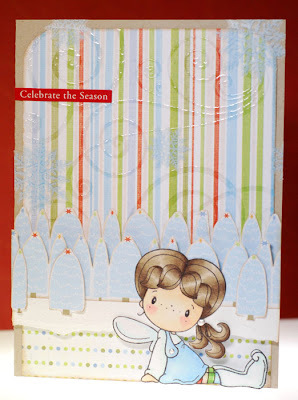 All I did was some quick stamping right on it, colored in the bird and wove the ribbon up the border. I've used a gold Copic Spica pen on the bird and as always I just can't get the shimmer to show up well in the photo but in real life it really helps dress up this simple card. Hello and happy Tuesday! 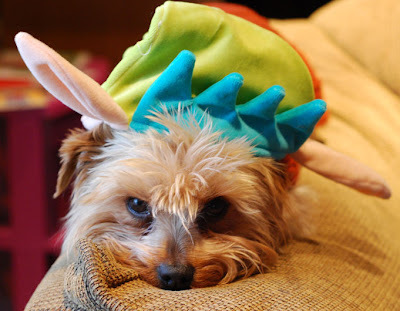 Is everyone still hangin' in there with all the holiday hoopla? I'm working today so it's still the daily grind for me. 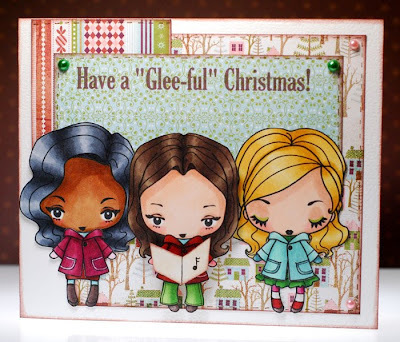 But before I head off I just had to share my card that is a special tribute to my number one most favorite show... Glee! LOL! Alrighty, that's enough begging and pleading for one day, LOL! Until tomorrow, be jolly by golly! Can I just say that I am still really diggin' these mini Anyas and hope that we see more (including Ians) from TGF in the future... hint, hint, hint! ;) I'm so subtle... LOL! Alrighty it's time for work, later dudes! Mmmmmm... hello friends. Yep, I'm late posting this but I needed a good sleep in and take it easy kind of morning. Especially when you just know this whole next week is going to be a mad flurry of work, busy-ness and activity... what with Christmas being only FIVE days away now! Craziness! 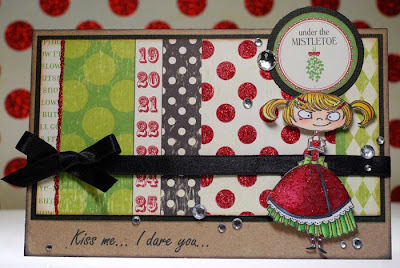 And once again I pulled out the handy-dandy MME card kit to make this one quick and easy... which at this point is what I'm all about LOL! Ok, I'll see ya tomorrow at our regularly scheduled posting time, I promise! I know I keep saying it lately, I think it must be the time of year because I need to post and run again as I've got to go to work today. Hopefully things will get back to normal after next week. Now Anya is ready to stroll through the neighborhood taking in all the fantastic lights and decorations... hopefully she doesn't give in to temptation and sabotage the Jones' light display, making it impossible for them to take the "Best House" prize five years running LOL! Be good... you know Santa is watching! I'm still on a roll with the whole combining challenges thing, even if I haven't broken my record of two... LOL, it's all good though. 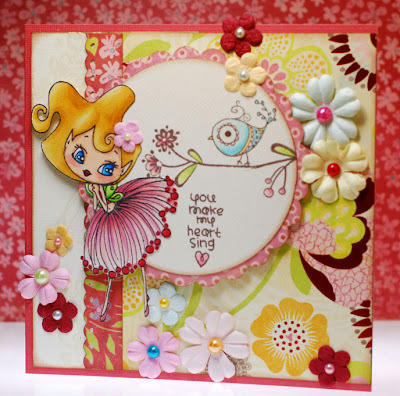 So my card combines this week's Diedrich Dare sketch challenge and this week's Cupcake Inspiration Challenge. 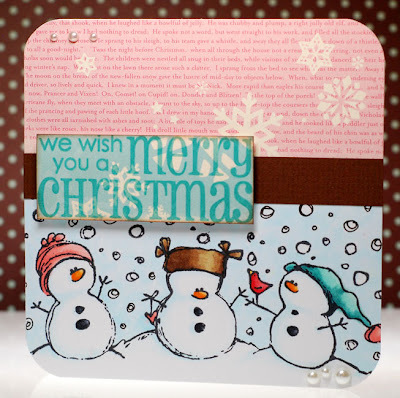 I loved the whole pink, aqua and brown color combo plus I just couldn't resist the chance to pull out these cutie snowmen stamps that have been a favorite of mine for a couple years now. Something about the sketchy way they are drawn totally reminds me of the comic strip Calvin and Hobbes (which I'm still totally bummed over its not being written anymore...sigh). But I digress... back to the card, when I saw Jack's sketch I immediately saw a whole stamped bottom panel rather than my usual cut-out image and it was fun to create an entire scene. Thanks for stopping by today, I'll chat with ya again manana. T minus eight days and counting until Christmas, are you ready for it? 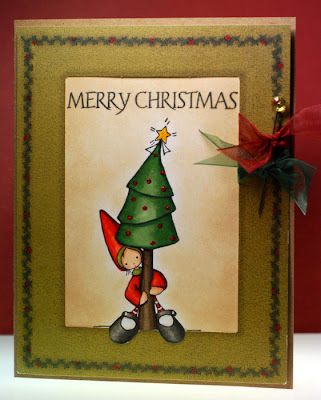 As you can see I'm still in the Christmas spirit when it comes my cards and I just couldn't resist inking up one of my new Moonlight Whispers stamps from Kraftin' Kimmies. I love the cute, yet kinda twisted Tim Burton-ish look of these little gals... it appeals to the snarky side of my personality, LOL! Okey dokey I'm audi... gotta get to work. See ya'll tomorrow with more challenge fun! No Christmas card from me today... I know, I know, I can't believe it either. 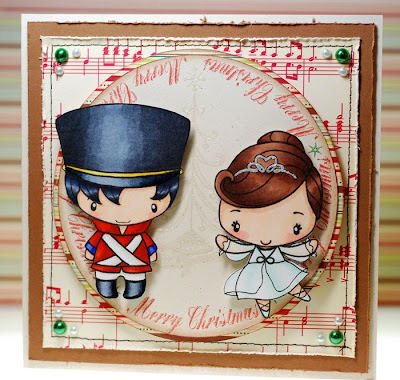 But I just had to share the card I made for the TGF newsletter digi fairy contest. Last month they issued a challenge to send in a card using one of the fairies for a chance to win a fifth exclusive digi fairy and apparently I was the only one who sent in a card for it. Shock! But if you've read yesterday's newsletter, there's still a shot at getting your hands on Vanity Fairy so start sending in those fairy cards to Jess asap! Oh and I thought it would be fun to note how I did the dangling beads over on the upper left corner... so when I machine stitched the border strip I purposefully left two long threads at the end of the paper when cutting it from the machine. Then it was simply stringing beads and tying knots until I had it the way I wanted it and the movement is a lot of fun in real life. I think I'm suffering from hop hangover... LOL! 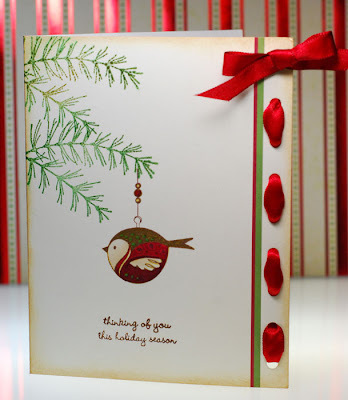 Club Anya Holiday Blog Hop! 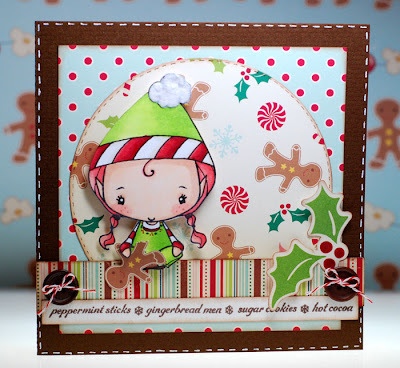 Welcome to the Club Anya Holiday Blog Hop! Today we are celebrating the newest stamp release at the Greeting Farm which will be available for purchase tonight at midnight CST... yeah! And if all that wasn't enough fun for you we also have a chat going on over at the Club Anya PCP page right now. The chatter is quick and lively and always a blast... hope to see ya there! 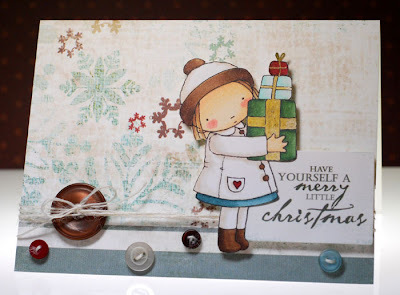 Ok, so I had a couple different ideas for my holiday hop card today and in the end I didn't even use a single "Christmas" TGF stamp at all... gasp! 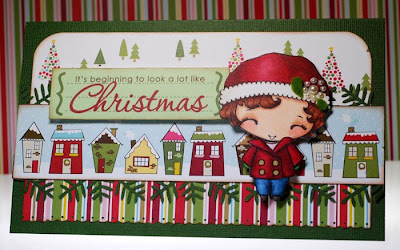 So is it really a surprise that I've got yet another Christmas card to share today? I didn't think so... LOL. The whole card came together pretty quickly considering I once again raided my stash and found an old My Mind's Eye frame-up that makes it look like I cross stitched a little berry border without all that work, gotta love it! Welcome to the weekend friends... isn't it wonderful? It is for me because I have the day off this week, yeah! I'm sure I'll have plenty to keep me busy and then tonight I'm going out to a Christmas dinner with my work peeps... fun, fun, fun! So let's see what all I've got going on here... well, I used the adorable Swiss Pixie Gretel from CC Designs and the only altering I did was add a couple stripes to her legs so I could color in funky tights that matched the striped paper. Oh and I also heat embossed the flourishes on the striped paper with clear Ultra Thick Embossing Enamel for a subtle 'blowing wind' effect. The rows of quirky little trees were hand cut from a sheet of pattern paper. Nothing mind blowing or super inventive technique wise but this card just makes me smile and isn't that what we all hope our cards do? It's finally Friday and if that wasn't reason enough to be excited just look at this fantabulous new Miss Anya set that's being released on the 15th! 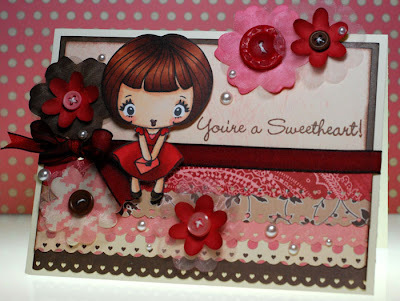 This little trio absolutely stole my heart the second I laid eyes on them and when it came time to make my card for today there was no way I could choose just one... so a Valentine card set was the way to go. And even though I was making three cards, by staying within one coordinating paper collection and one basic over-all layout design these were a breeze to put together. Now if you haven't stopped by Club Anya yet you really must go see what my fellow CADT have done with this sweet set... as always just some really beautiful creations.